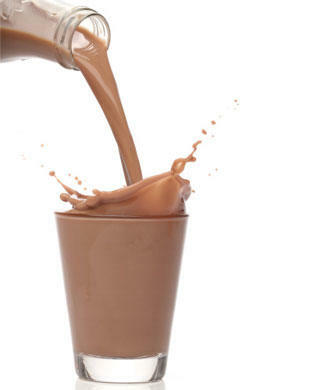 Chocolate milk boosts exercise recovery more than sports drinks, new research suggests. The popular milkshake allows athletes to intensely exercise for around six minutes longer than sports drink without tiring. It also improves exercisers' heart rates and lactic-acid levels, which causes cramp, just as well as beverages marketed for post-activity recovery, the research adds. Study author Dr Amin Salehi-Abargouei from Shahid Sadoughi University in Yazd, Iran, said: 'Chocolate milk contains carbohydrates, proteins, fats, flavonoids, electrolytes, and some vitamins which make this drink a good choice for recovery in athletes.